If you are looking for a matching pair of diamonds to make stud earrings, these brilliant pear shapes could be the ideal pair for you. The eye-catching pear shaped diamond produces great fire in the top part of the diamond and they are great for diamond stud earrings. Some customers may also choose several smaller pear cut loose diamonds to surround a center stone of a diamond engagement ring. 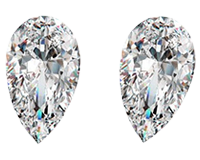 If you are choosing a pair of pear shaped diamonds as diamond stud earrings, be sure to check that they are well-matched in clarity and color grade.